Just opened AGP.. Sand coming out of return. Help please..
Just opened my APG.. When I turn on my pump a large amount of sand comes out of the return and then slowly gets less and less.. The pressure is low (around 12 PSI).. I tried backwashing and my crystal is clear and the water being discharged is also clear..
Can someone give me a list of steps to troubleshoot, please? My filter is ginormous and I cringe to think one of the laterals cracked or something..
Having just opened for the season, I'm assuming your filter had all the water drained. Did you leave the sand in, or was it removed as well? I honestly can't remember if I drained the filter.. I'm pretty sure I did.. I do house the pump but leave the filter and heater out..
No, I've never removed the sand in it..
- Damaged lateral or stand-off pipe in the filter itself. 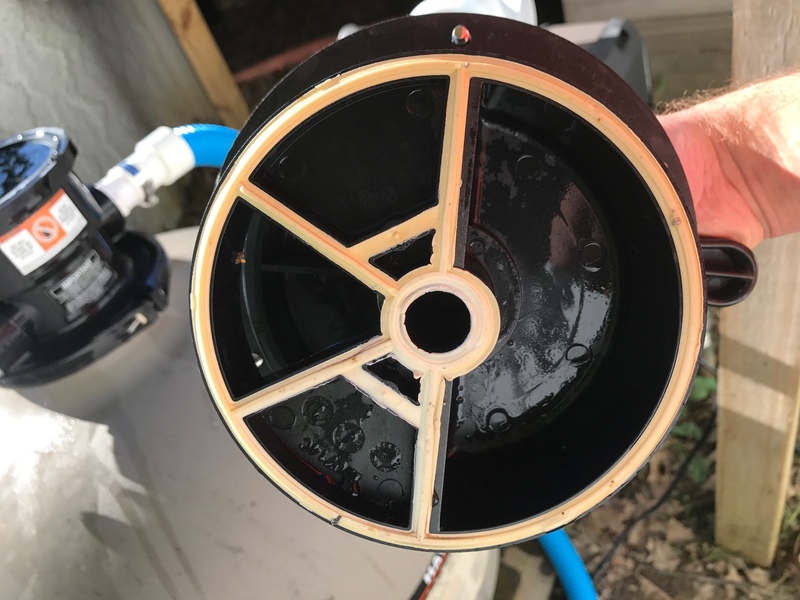 It sounds like you drained the water which should've helped unless an unusual amount of water was still trapped inside and may have expanded/cracked something during the winter. I would start at the easiest items above before working my way down into the filter itself. Hope that helps. So I'll rinse tonight for a few minutes and see what happens..
Then, if that doesn't address it.. I'll check the spider gasket..
Then.... Hopefully I won't have to empty it all and check the laterals..
OK so I backwashed for a few minutes.. The crystal never went completely "sandless" but I ran it until almost no sand was in it..
Ok, first off your water level is way too low in the pool. Don't try to backwash or rinse when the water level is below half full in the skimmer opening. You won't have sufficient water to backwash or rinse the filter properly and you could also damage the pump by letting it run nearly dry. In your second video I can see the siteglass fill with sand. That is not normal. I can also see there is a leak in the multiport valve. That may or may not be your problem. At this point you should inspect the multiport valve and make sure the spider gasket is in good condition, no excessive wear, and firmly attached to the multiport. If it is not then you will need to replace it. Some Hayward model multiport valves require you to replace the key instead of just the spider gasket. Is any water leaking out of the backwash line when the pump is on filter? You should also go ahead and inspect the stand pipe and make sure there are no cracks. If that looks good and the multiport looks good you will need to inspect your laterals. Going to check the pipe now. No leaks that I can see. Yep, that will do it! You will need to replace the standpipe. You can reuse the sand if you scoop it out onto a tarp or put it in a wheelbarrow or buckets. I would go ahead and scoop it all out and inspect the laterals in case any need to be replaced. You can put the multiport back on and run the filter on recirculate until you get the replacement parts. You just won't be able to filter the water and you would have to vacuum to waste if you absolutely have to vacuum before the parts are replaced. That was a lot of sand to be coming only from that standpipe crack. I think you may find some lateral damage when you remove the sand. Do I have to replace the entire apparatasus? I found the manual and it doesn't have a part number for just that pipe.. 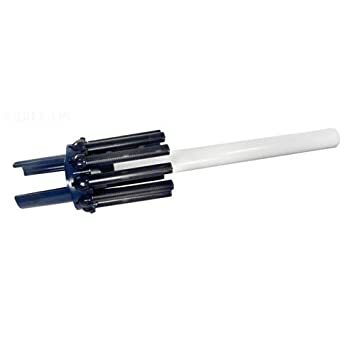 It does have a part number for a lateral but not the PVC.. Is it just standard 1" PVC? That will teach me to not drain the filter!! It wasn't on purpose.. Just completely forgot.. $75 lesson..
That whole thing includes the laterals. You slip it in looking like that and then fold the laterals down sort of like an upside down umbrella. Use the search box up in the corner or hunt on youtube for instructions on replacing sand. I know there's some tips about filling the tank with water first and covering the standpipe while filling to keep fresh sand out of it. A shop vac beats scooping by hand, too. I don't know if the pipe is cemented into the lateral assembly or not. If it is you may need to replace the whole thing. Once you have emptied out the sand you can check. Well not draining it really did a number. Lesson learned!! Cracked all the way down and the laterals just fell out. Question.. hope you can tell but I just put all the sand on a tarp to put back in. Does it look like I should add more? If you didn't pre-calculate the amount per the manual, many filters want about a 12"-15" from the discharge portion of the multiport to the top of the sand. Or in simpler terms, about 2/3 - 3/4 full should work. Well I'm back up and running. One more question.. is it safe to sweep all the sand I have on my floor? It's a considerable amount. I'm not sure how else I would do it but worried it would somehow get in the pump and jack the pump up.. Depending on how much there is, you could vacuum some of it up. If it's a lot, perhaps try to gently brush it into one location and scoop most of it up.